Late in the afternoon of Thursday, Oct. 24, Guy Monty had the greatest surprise so far in his role as Moorecroft Regional Park’s caretaker. The Nanoose Bay Field Ornithologist spotted Northern Hawk Owl perched in a fog-shrouded snag beside the rocky beach at Moorecroft’s Vesper Point. The Northern Hawk Owl is a resident of the northern hemisphere boreal-taiga habitat, a boldly patterned icon of remote and lonely forest glades. This zebra-striped grey bird seemed out of place silhouetted against the waves. Monty’s find is the first official record of a Northern Hawk Owl in the Parksville-Qualicum Beach and Area Bird Checklist. Though not a migratory bird, this Northern Hawk Owl will likely wander south and possibly head back into the boreal regions of B.C.’s Interior. Female Hawk Owls are larger than the males and are exceptional hunters. They may be quickly seduced by a male capable of finding the best woodpecker cavity in a nearby patch of trees, where they may lay an incredible 13 eggs. 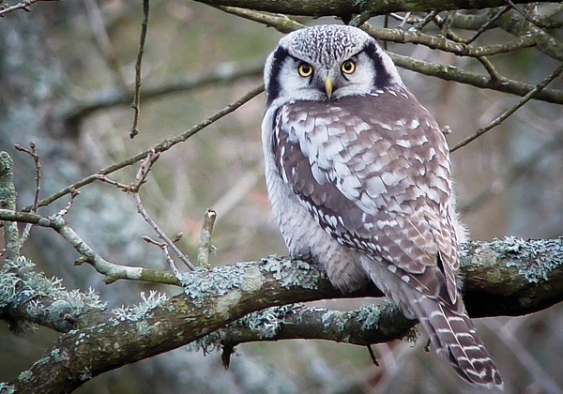 In 2009, a Northern Hawk Owl staying in Cedar became a local celebrity with the nickname Hazel. Although cute in appearance, she distinguished herself as a fierce killer when she suddenly swooped and bit a Townsend’s Vole clear in two, staining her dark facial feathers crimson red. Despite being little larger than a crow, a hawk owl may bring down a Snowshoe Hare with its powerful talons and bill. Hawk owls don’t give a hoot about being normal owls. Most owls are exclusively night predators with see-in-the-dark vision and silent flight but the Northern Hawk Owl is entirely diurnal. They vocalize with sandpiper-like whistled trills, the males having higher pitched voices than females. The reason for its portmanteau name becomes clear upon seeing the long-tailed bird darting through the trees during broad daylight in true hawk-like fashion. Hawk owls aggressively pursue forest birds at lightning speeds in spectacular scenes of air-to-air combat. This is the best time for finding unusual birds in B.C., according to Russell Cannings, author of ‘Birdfinding in British Columbia’ and a lucky viewer of the Moorecroft anomaly. Keep an eye out for the stray Northern Hawk Owl, as well as a Golden Eagle in Nanoose Bay; a Chestnut-collared Longspur, Rusty Blackbird and Sharp-tailed Sandpiper in Victoria; and a Mountain Bluebird found Oct. 22 at the Englishman River Estuary Art Gallery. Christopher Stephens is a field ornithologist studying through Royal Roads University, nature writer, and the birding tour leader for B.C.’s Pacific Rainforest Adventure Tours. To book tours to view Oceanside’s outstanding array of birdlife, call 250-248-3667. Call 250-954-3724 if you have a question about wild birds for the author.